When the United Kingdom declared war on Germany in 1939, the Union of South Africa, like all the dominions of the British Empire, followed suit, although only after a bitter internal argument over the justification for war and the ability to conduct one. However South Africa’s armed forces were tiny and poorly equipped, so much work was required before the country could play a significant role in the war. In terms of the infantry, that role began with their involvement along with British and other imperial forces (plus some Free French and local resistance) in the liberation of Abyssinia, Somalia and Eritrea from their Italian occupiers, since Mussolini had declared war on the British Empire in June 1940. The East African Campaign, which ended with Italian surrender in November 1941, was one of the first major victories for the Allies. The most famous involvement of South African soldiers in World War II was in North Africa and Italy, yet we have ignored those crucial campaigns because this set seems to. All the men here wear the same uniform, which copies British Khaki Drill in having long trousers and short anklets over boots, and a jacket. On the head is the South African version of the sun helmet, with its narrow brim and puggaree, and this was indeed the uniform worn at the start of the war. However these men are clearly in action, and so you would expect, as we did, that they would wear their British-style steel helmets for their obvious protective qualities. However there is photographic evidence that at least on some occasions the sun helmet was worn in combat, and from memoirs it seems this was quite common in East Africa. Certainly the sun helmet was much more comfortable to wear under the baking African sun, and was very widely worn behind the lines and out of action, but for it to be worn in preference to a steel helmet when the bullets were flying must be a testament to how comfortable it really was. For the North African campaign a much more casual uniform was worn, although again including the steel helmet when in action, and by the later Italian campaign British battledress was the norm, so we can only imagine these figures are for the early campaign. The men’s webbing varies to an extent but everything matches photos taken at the time so there are no problems there. Most of the weaponry would also be based on the British armoury, and as most of these figures carry a rifle this is probably the SMLE, which is about the right length, though detail is too poor to make identification certain. The first figure in the third row is firing a Lewis gun, which was obsolete by the start of the war but a few were still in service and it is easy to accept that some may have found their way to East Africa in 1940. However this is a sign of how desperate the South Africans were for weapons in the early months. 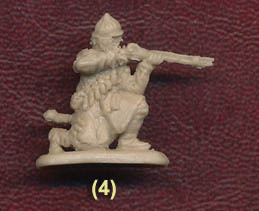 Two figures in the same row carry a submachine gun, but which one? Submachine guns in use by the British before the end of the East African campaign were the Lanchester and the Thompson, but this is clearly neither of those (which is good). It looks like a Sten, and specifically the Mark V since it clearly has a solid wooden stock, but it is about 16 mm (115cm) long when the real thing was only 91cm long, and the first Mark V did not appear until 1944! In fact, this mystery submachine gun is a fraction longer than the rifles, but what the sculptor is thinking here we cannot guess; either a terrible model of a weapon that did not exist at the time, or one we have not heard of before. Candidates such as the Bergmann MP18 or MP34, the Reider Automatic Rifle or even a Beretta have been suggested, but we are not convinced that any of them are what was intended here. Add to that the fact that submachine guns were little used in Africa as their short range made them of limited value in the wide open spaces of the desert, and we cannot find anything good to say about these two figures. So the uniform and some of the weapons gave us cause for concern, but the poses are more conventional. They are not particularly energetic, although we liked the first and third in our top row. There are several kneeling or prone, which is particularly useful where cover is sparse, but everything here is reasonably useful. The somewhat unrefined sculpting style of Strelets is the rule in this set, but not too bad. As we have said, areas where detail is more critical, such as weapons, reveal the shortcomings, but by Strelets standards this set is quite fair. They look like they have been given swords, but this must be a combination entrenching tool and bayonet, though again the detail is lacking to make this obvious. One amusing feature (apart from the hilarious box of course) is the Lewis gun, which has an obvious kink somewhere below the magazine so when viewed from above the trigger and stock are nowhere near lined up with the barrel! There is a bit of flash on all the men, but the fairly flat poses means there is no extra plastic apart from around the heads of the two prone figures, where it is obvious. For East Africa it seems many men looked like these figures even in battle, and these do also have the advantage of being very recognisable compared to the other British and imperial forces. The two submachine guns are a mystery, and as usual the sculpting is not that great. So there are some concerns with this set, although it is at least encouraging to find a manufacturer acknowledging the East African campaign. We need more sets for this conflict, but hopefully better ones than this.